Email is the most effective marketing channel with 4400% ROI and $44 for every $1 spent. Running a blog without growing an email list is doomed to fail just like trying to ride a dead horse. 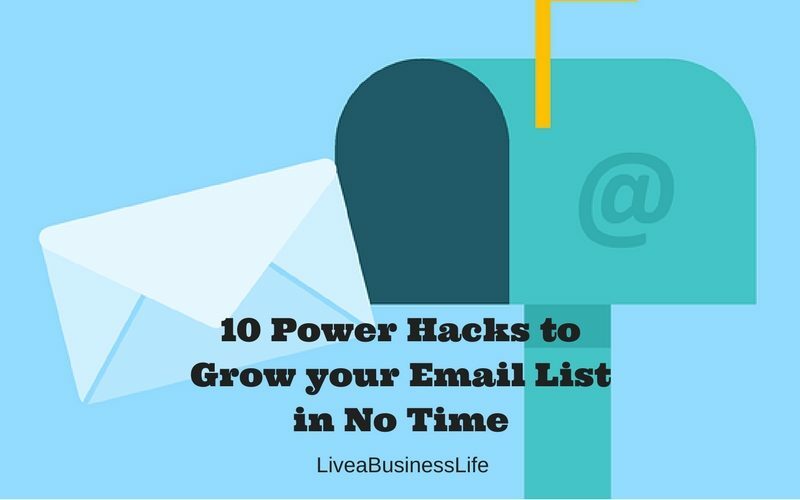 This is why I have written a post on the basics of email marketing and 10 power hacks to grow your email list in no time. All of these methods are recommended by experts so there’s no doubt about the amazing results you’ll get from them. Your email list is a list of your email subscribers. 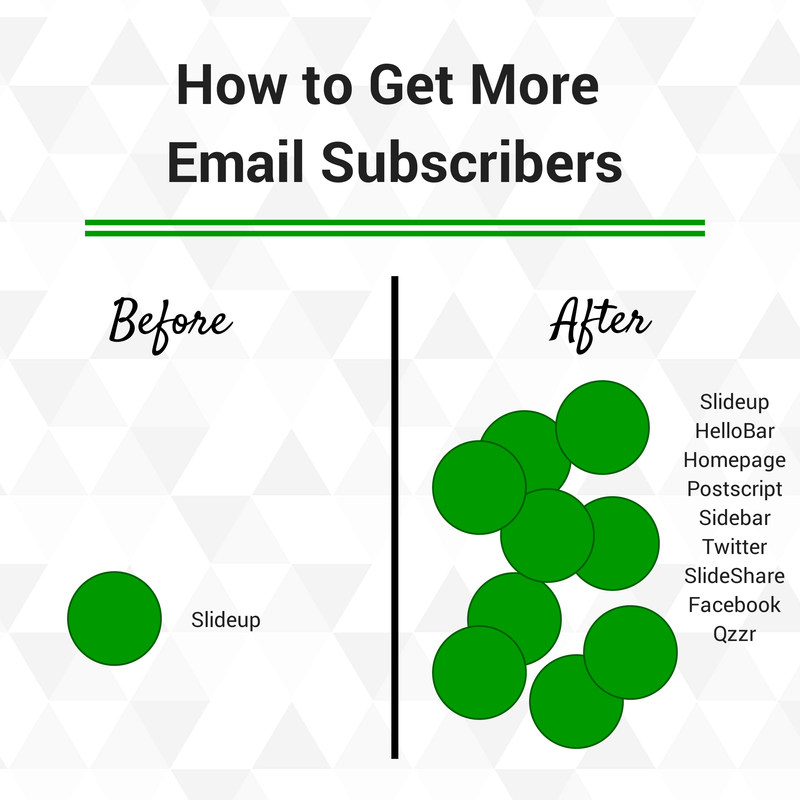 Some say that growing your email list should be your blog’s number one priority and whatever you do from writing blog posts to promoting your content should finally lead to more email subscribers. It a great source of traffic. 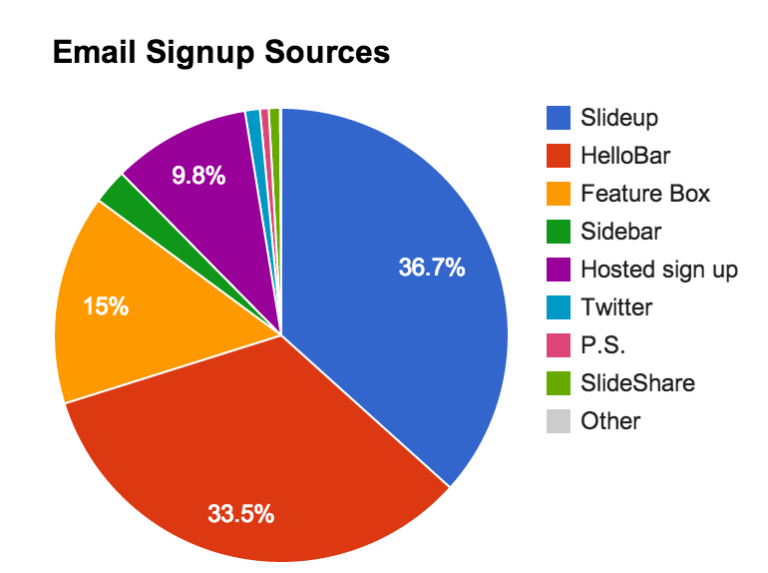 You can send out your latest updates to your email list and get people on your site for free. Use WordPress plugins such as Newsletter or Mailpoet that send emails from your own host. Use Email Service Providers (ESP’s) that have premium services. WordPress plugins depend on your hosting to deliver the emails which is not a reliable way –you’ll experience delays in sending because the number of emails sent per day from your hosting is limited. With plugins, you won’t have access to many other email marketing features such as automation, autoresponders, landing pages, etc. So, it’s best to use a great email service provider such as Mailchimp, Constant Contact, Aweber, Convertkit, Getresponse, etc. All of these platforms I have mentioned have amazing features and you can rely on any of them. 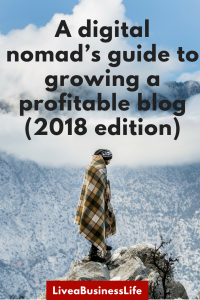 There are also some cheaper platforms out there so if you’re running your blog on a shoestring budget, you can do your own research on affordable ESP’s. However, it seems that Getresponse offers more features for a lower price. For example, they offer advanced landing page tools and a webinar service (which is cool) in their pro plan with a lower price than any other ESP’s. You can start your free 30-day trial today and then go premium with only $15 per month. This price is at least $10 less than market standards. The second step is making some opt-in forms and placing them in different places on your website. Nearly all email service providers have the tools to make opt-in forms, so you just need to log in to your account and start creating forms using their templates. Getresponse has an amazing sign up form creator — check it out. You can also use some premium plugins such as Thrive Leads, Opt-in monster, Bloom, Opt-in Panda or free plugins such as Opt-in forms. Using these plugins, you can place your opt-in forms in any possible place on your site or even make some pop-ups to increase the sign up rate. The next step is offering a valuable giveaway in your opt-in forms to lure your visitors into signing up. Your giveaway could be an ebook, ecourse, video, etc. We will talk about different kinds of giveaways as we go on. 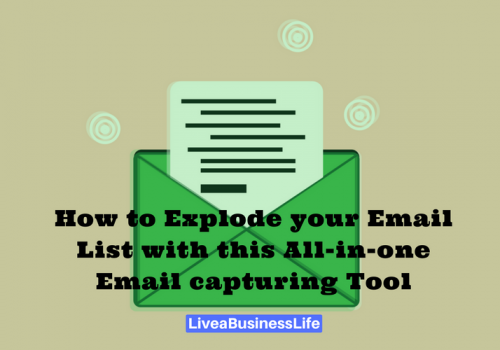 One of the best ways to grow your email list is adding a complementary piece of content to a blog post and giving access to it in exchange for an email address. A checklist of the greatest tools and tips, a recorded audio or video tutorial, a report, etc. could also do the trick. Remember that you don’t need to add a content upgrade to all of your blog posts, relevant upgrades for the most popular posts of your blog can be enough. Head to Google Analytics and identify your most visited blog pages. Then depending on the type of your post, create a complementary upgrade and add it to the end of your post. The PDF version of the post, a template, a table, or a more detailed guide will be perfect. You could even have a special sidebar or pop-up for that page and offer your upgrade to the visitors. When it come to giveaways, there are two things you need to do: first, add a major comprehensive irresistible giveaway for all of your visitors, and second add some secondary specific giveaways for some segments of your visitors. Major comprehensive giveaways are designed to be appealing to all of your visitors. Depending on the services you offer or the topics you cover in your blog, you should make long form free giveaways that cover generic issues in your field, and offer them in exchange for your visitors’ emails. Some example of major comprehensive giveaways include: long-form ebooks , ecourses, comprehensive guides, etc. Major comprehensive giveaways have a particular feature in common: they target the majority of your visitors and not some sections of them, and they are ideal for your homepage. For example if your website targets the people interested in conversion optimization, the best performing giveaway for your homepage is a comprehensive guide or ecourse on tools and techniques of conversion optimization, not a guide on a specific subcategory of conversion optimization like A/B testing (although it works, it’s not the best option). Although you might have a degree of success with a short guide on A/B testing, the results will be way lower than a comprehensive guide, webinar, ecourse etc. on conversion optimization. Figure out the main topic of your website and create a major comprehensive giveaway that covers the most ground in your field. Then add an opt-in form on your homepage, your sidebars, at the end of your posts, and footer. Opposite to major comprehensive giveaways, segmented giveaways are shorter and cover a specific subcategory of your general topic. The examples include templates, spreadsheets, tables, or some specific guides. By offering a segmented giveaway to your visitors, you can make sure that you target the people who are only interested in one subcategory of your topic. For example, if your website is about SEO, it’s a good idea to add some short form segmented giveaways about link building, on-site SEO, local ranking, etc. This way you’re targeting the people who are exclusively interested in these subcategories. What are the most searched for subcategories of the main topic you cover on your website? Spend some time to find out the hot topics in your niche, check out your most visited blog posts, segment your email list based on various topical subcategories or your visitors’ interests, and create some specific segmented content bases on your findings. You need to put your opt-ins for the segmented giveaways only on some relevant pages of your website. These days, people are interested in live videos and presentations, and keen marketers just know how to take advantage of this. Webinars are online live presentations that people can attend and even interact with. Free webinars could be amazing for list building because people need to reserve a seat or have an invitation in order to attend them. Some of marketers keep giving out webinars on a weekly basis and they most probably have a huge number of sign ups each week. Try to find out the most problematic issues that your audience faces and prepare you material. You’ll probably need to display some slideshows while you’re talking — for this you can use PowerPoint. Then you need to set up the webinar with a provider such as Gotomeeting, Zoom, or Webinarjam or a WordPress plugin such as Wpwebinarsystem. You can also host your webinar for free using using Google+ hangouts or Youtube Live. If you’re using Getresponse as your email service provider, you can take advantage of their webinar tool at no additional cost. Click here to find out about Getresponse webinar solution. Epic content is typically long and comprehensive and contains original insights. To have a clear view of how epic content looks like, you can take a look at Brian Dean’s blog, Matthew Woodward’s blog, this post by Ryan Deiss, or some other examples. The reason epic content will bring you more traffic is that it establishes your authority and hacks you name on the mind of your readers. Once they trust you as the source of great information, they try not to lose your posts by signing up to your newsletter. 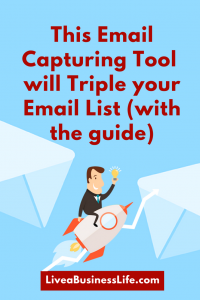 The greatest way to grow your email list is including strong relevant call to actions in your epic posts. 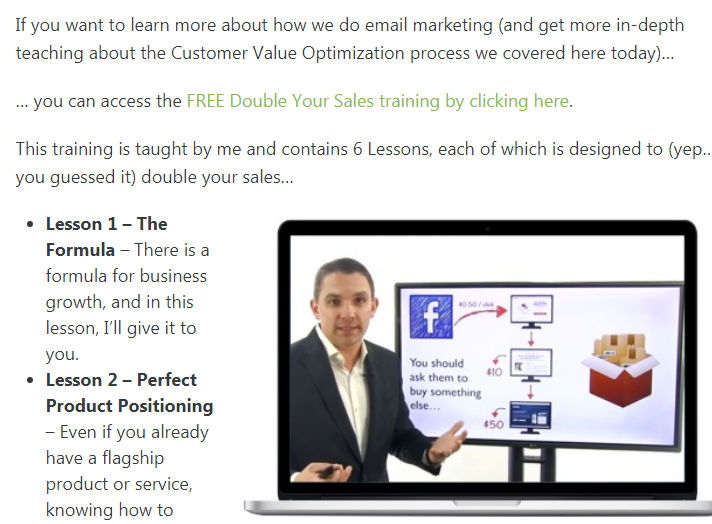 For example, at the end of his epic post on Customer Value Optimization (a must-read), Ryan Deiss introduces his free “Double your Sales” course and asks readers to join. Note that he does not simply include a feature box at the end of his post, he explains the benefits, features, and the content of his course in the post and includes a link to the course’s landing page. Spend some time on your blog posts, do a lot of research, add a lot data and case studies, be as comprehensive as possible, and edit your posts like crazy. This guide by Copyblogger could help you write amazing content. Then at the end of your epic post, talk about a valuable giveaway related to your post. Explain the benefits, feature, and the content of your giveaway and include your opt-in form. Competitions could go viral if the reward is valuable enough. Webprofits could generate 2,987 emails for a total cost of $6,661.11 in just over a month by running a viral competition. To do this, you need a tool like Kingsumo. You set up a valuable giveaway as the prize of the competition and use Kingsumo to make a real contest. People need to enter their email address to enter the competition and if they answer the question right, they get 1 point. But in order to get more points, they need to refer more people and with each sign-up they refer they get one extra point. Come up with a valuable prize for your competition. Paid access to premium plugins and tools is one of the greatest incentives. Then get your competitions started with Kingsumo or a contenst wordpress plugin (Here are 7 of them). 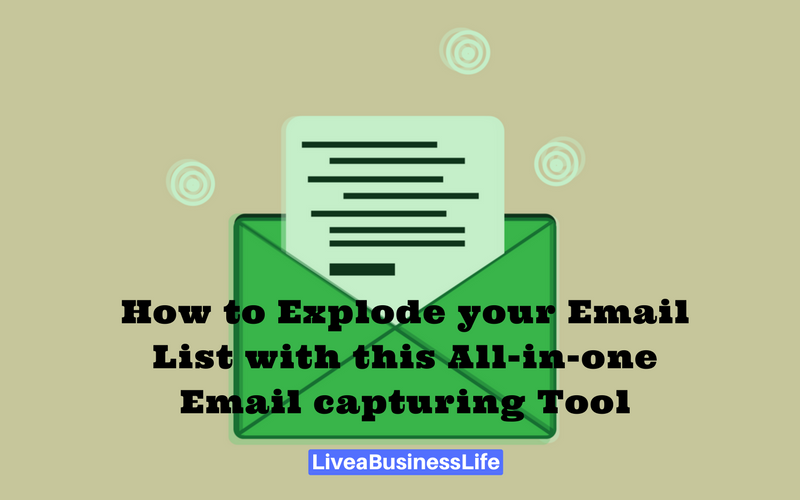 A big mistake you can make in growing your email list is not including your opt-in form or giveaway in various places. Simply including your opt-in form in your homepage or sidebar will never be enough. 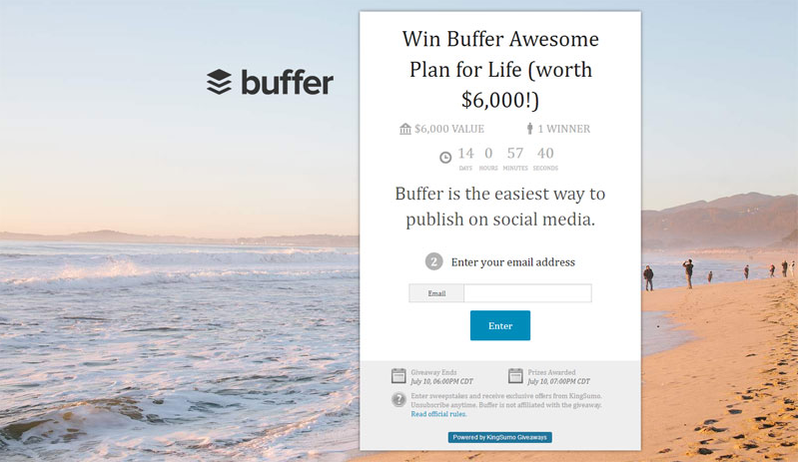 In fact, folks at Buffer were able to double their email sign-ups in 30 days by including their opt-in forms in various places on their website. They included their email capture opportunities in 9 different places. In order to find more information on each place and the tools they used to do it, just visit the blog post. Some people are very picky with submitting their emails for free giveaways and are not convinced that your giveaway is suitable for them unless they see what’s inside and what they will learn from it. 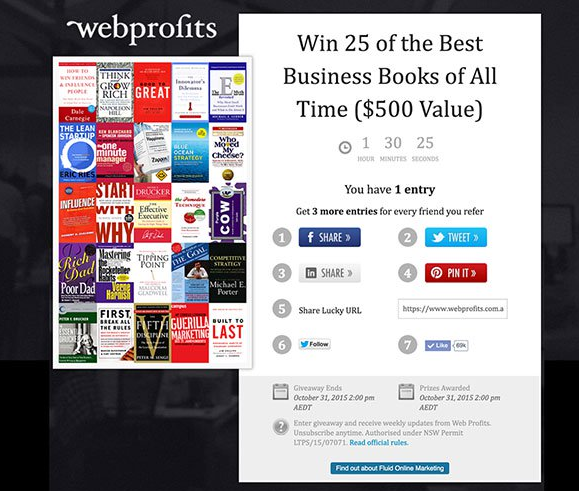 Creating a landing page for your giveaway could be a great idea. You could explain the benefits, features, the content, and use high-quality images to convince your visitors that they’ll get an amazing reward in exchange for their emails. Include a short landing page for your giveaway. Hubspot frequently does so. They literally create a different landing page for each of their giveaways. 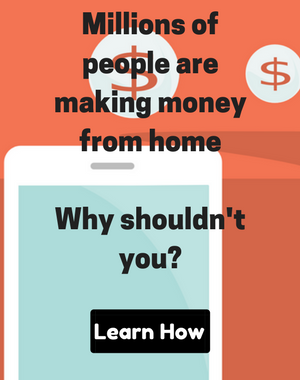 Check out this landing page for a simple ebook. In order to make landing pages you can use some premium platforms such as LeadPages, or some wordpress plugins such as Thrive Architect, WPBakery Page Builder, Beaver Builder, Elementor, or Optimizepress. 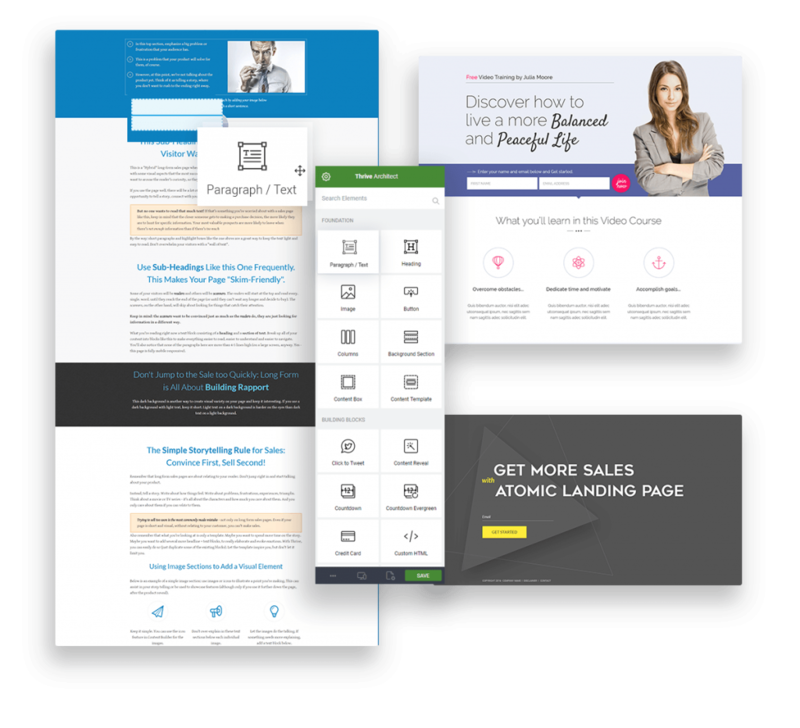 Thrive Architect is an amazing page builder with more than 220 landing page templates you can immediately use on your own website. With their one-of-a-kind front-end editor, you can literally change any element on your pages with laser focused precision. Also if you’re using Getresponse as your email service provide, you can take advantage of their professional landing page builder at no additional cost. Remember that the landing page for your free giveaway should not be very long. Just insert a great image, explain why your visitors need the giveaway (the benefits), and include what’s inside your giveaway (the content). Pop-ups are considered disturbing by many marketers. It could really frustrate your readers to see a pop-up immediately after they got into your blog, especially if they waited a long time for your page to load. But marketers are seeing results from pop-ups. Popups have various kinds and you could make them less annoying by tweaking some display settings (add time triggers for instance). A pop-up might be in the form of a welcome mat, a generic overlay pop-up, a top banner, or a slide in box. In order to make beautiful pop-ups you can use some premium tools such as Sumome, Hubspot, Thriveleads, Opt-in monster, Bloom, or ConvertPlus. You can also take advantage of some free wordpress plugins such as Hustle, Pop-up Builder, Pop-up Maker, and Pop-ups. With Thrive Leads you’ll have access to various kinds of popups. Using their advanced targeting options and Smart Links, you can easily show a different set of popups for your subscribers and engage them rather than frustrate them with the same old popups. 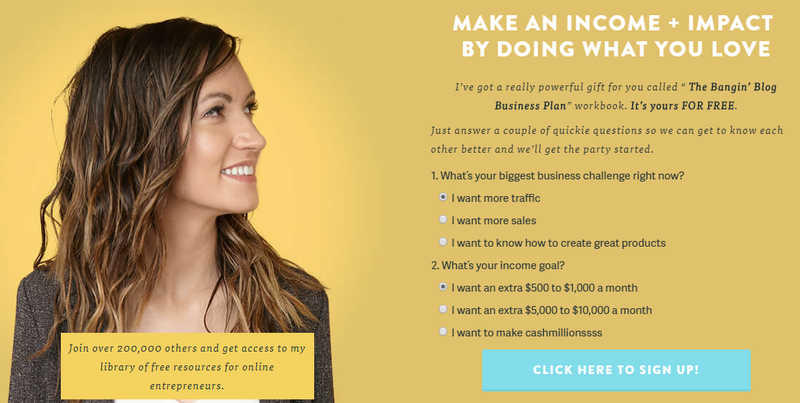 Here are the opt-in forms and popups you’ll get with Thrive Leads. ThriveBox (Popup Lightbox): An unblockable overlay (a.k.a. popup) that is displayed above your content and is very attention-grabbing. “Sticky” Ribbon: Add a ribbon type form which shows at the top of the screen and remains “sticky” as the visitor scrolls down the page. In-Line Forms: Automatically insert an opt-in form at the bottom of your posts or insert them anywhere using a simple short code. 2-Step Opt-In Form: Create a 2-step signup process by adding buttons or links that open a lightbox on click. Slide-In: Less intrusive than a popup, but almost equally attention grabbing, this form slides into view from the corner. Opt-In Widget: Add an opt-in form to your sidebar or any other widget area on your site, with just a few clicks. Screen Filler Overlay:The “unignorable” opt-in form and the perfect way to make sure you get your visitor’s full attention on your offer. Content Lock: A great way to add an opt-in incentive right inside your content. Reveal it once the visitor signs up! Scroll Mat: A unique type of screen-filling offer that appears from the top of the page and pushes the content down. Multiple Choice Forms: Engage your visitors and boost conversion rates by offering multiple choices! You can get an amazing traffic from popular blogs in your niche if you get featured on them. And if you have an amazing relevant giveaway for the traffic, you can easily grow your email list. Find some relevant popular blogs in your niche. 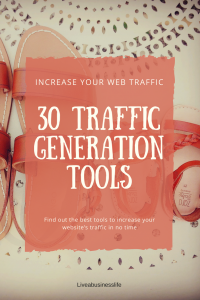 Consider their traffic, the topics they cover, and the giveaways they offer to their visitors (they’re probably offering a giveaway that’s working for them). Create a list of them and update it regularly. The next step is to get featured on a website and then offer the kind of giveaway that is interesting for their visitors in the page you link back to. Guest posting: guest posting is when you write an article for another blog as a guest author. In order to publish your article on a blog, you first need to check out their guidelines for guest posting (typically found in the footer). You could also contact the editor and ask if they accept guest posts. Remember, the aim of guest posting is to establish your authority and drive a portion of a website’s traffic to your blog. So make sure you link to your best posts in your guest article. Also take advantage of the different contextual opportunities to have a call to action in your article. If you have case studies or examples in your own blog, provide the link and ask readers to visit them. And finally make sure that you add a content upgrade at the end of your guest post. Create a landing page for your giveaway, talk about how it benefits the readers and be transparent about the content inside it. Being a case study for them: this is actually an irresistible offer for any blog. You need to write a case study about how you used their services, tips, tactics, formulas, etc. and how you saw amazing results from it. Any blogger is looking for case studies and examples to prove that what they preach is actually working. And if you provide a case study for them, they will definitely feature you in an article. So be on a watch for any applicable tactic offered by a famous blogger, then use it, write a case study about the process and your results, and send it to the blogger. The process seems to be time-consuming but if you can do it right, the blogger will never stop mentioning you in future articles. Writing testimonials: famous blogs are always looking for great reviews and testimonials to feature them on their most visited pages. These reviews have a huge impact on what people think of them, so they try to feature the greatest ones on their homepage. What you need to do is write sincere and beautiful testimonials about famous bloggers you know and ask them to feature you with a backlink to your website. This is a great way to have a portion of their traffic and possibly a quality do-follow backlink from them. Growing an email list is the number one priority for bloggers and business owners because email is the most effective marketing channel. Your email list is the most reliable source of traffic for you (just shoot an email and they’ll swarm in your blog), and has the most sales potential with a whopping 4400% return on investment. A quick tip: because growing an email list is directly related to content production and project management, it’s a good idea to take advantage of an efficient project management tool. Ben Aston’s guide on the best Kanban tools (Trello and its alternatives) is a great help here. A lot of these are on my to-do list. Working my way through it, but it’s a lot of work. I’m actually looking for an email provider. I don’t know why you’re suggesting GetResponse! I’ve heard ConvertKit is the best choice for bloggers. Well for one thing GetResponse is extremely easy to use and they always have someone in their live chat who would help you with anything. Plus you can start your free 30-day trial immediately and then go premium with only $15 per month which is $10 less than the starting price of other ESPs. They also offer landing pages and a webinar solution with their email marketing services, which is amazing.